On Thursday night, a shooting spree in Chicago left 19 people wounded. 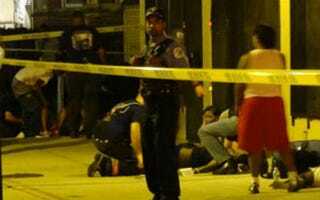 According to the Chicago Tribune, the violence was exacted by gangs, and within 30 minutes, 13 people had been injured. The violence only draw more attention to the rising murder rate in the Midwestern city. The overnight shootings peaked between 9:15 p.m. and 9:45 p.m. That's when eight people, many of them teens, were shot at 79th Street and Essex Avenue about 9:30 p.m.
Then two men were wounded in the Ida B. Wells / Darrow Homes complex at about 9:25 p.m., police said. The men, 27 and 33, were shot in the 600 block of East 37th Street and taken to the University of Chicago Hospitals, police said. The younger man was shot in the head and the other in the right arm, Gaines said. Around the same time, two other men were wounded in the arms in a drive-by shooting in the 2900 block of West 39th Place in the Brighton Park neighborhood. About 15 minutes later, a 24-year-old man was shot in the leg and taken to Jackson Park Hospital from the 7200 block of South Jeffery Boulevard, Gaines said. He was treated and released. The man told police he was talking on his phone when he heard a single shot and realized he was wounded. Earlier Thursday evening, four men were wounded in a shooting in the Little Village neighborhood about 5:20 p.m. Thursday, police said.